“Each co-op term has been invaluable to my professional development. If I were to select the three most valuable skills I have gained, it would be the ability to adapt and learn quickly in a new work environment, communication skills, and improved networking ability. The greatest benefit of a co-operative education program is the opportunity it provides you to apply the theoretical concepts learned in class to an industry and professional setting. In that way, the co-op program advances your learning. Additionally, it provides you with relevant work experience and networking opportunities, which in today’s competitive job landscape, is a major benefit. Daphne spent her final co-op at Scotiabank Global Banking and Markets as a Sales and Trading Analyst, a highly sought-after co-op position. She has since accepted a position for the Scotiabank Global Banking and Markets Sales and Trading Rotational Program beginning August 2015. Good luck Daphne! From March 16-20, 2016, Management Career Services is celebrating National Co-op Week. We’re inviting students in the Commerce Co-op Program, both those on campus and those currently on their work term, to participate in the celebration and enter for their chance to win prizes! 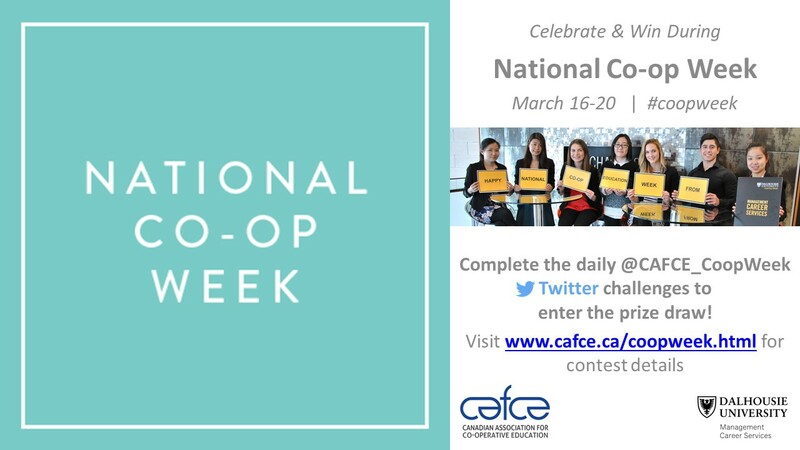 Co-op students On work term: Be sure to participate in this year’s National Co-op Week Contest – details below. Co-op students on campus: Management Career Services will join the Dal Management Society in the Rowe Atrium on Tuesday, March. 17 for a very special Rowe Recess. 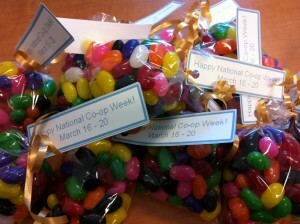 We’ll have some special treats to give away in honour of National Co-op Week. And don’t forget to enter the National Co-op Week Contest! Don’t worry co-op employers, we haven’t forgotten about you! The employers being visited for mid-term review meetings this week will be getting a special treat from Management Career Services to spread the celebrations. Employer Appreciation Event Sets The Stage For National Co-op Education Week! Monday, March 16th officially kicks off National Co-op Education Week but Management Career Services started celebrating today during our annual Employer Appreciation Breakfast. 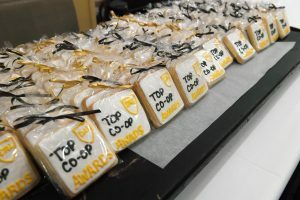 The event brought together representatives from our Employer of the Year, Citco, our Co-op Student of the Year, Daphne Wallace, and 8 of the 17 total supervisors from across the country who were nominated by their co-op students for an Employer Appreciation Award in 2014. The following supervisors were recognized for providing their student with an enriching work term experience which has undoubtedly made a positive impact in their lives as young professionals. 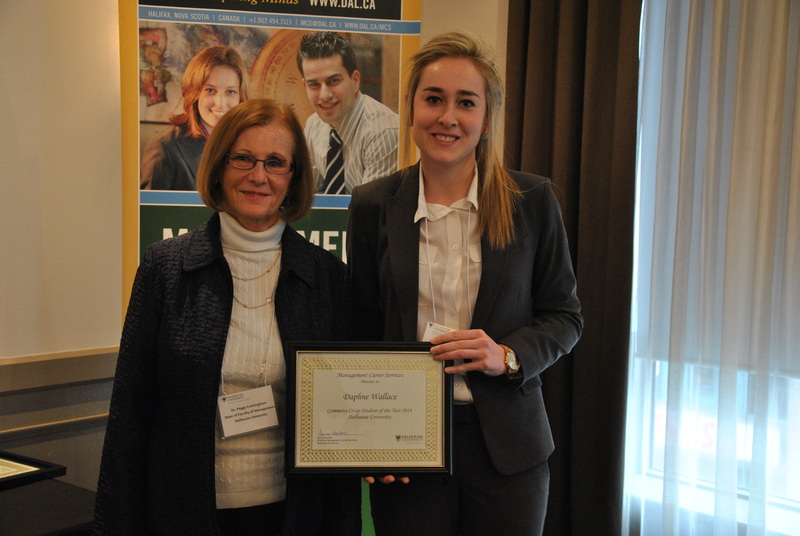 Fourth year Bachelor of Commerce student, Daphne Wallace, recently earned the title of Management Career Services’ Co-op Student of the Year through her exemplary work term performance, combined with her superior academic achievements, volunteerism, and student leadership roles. 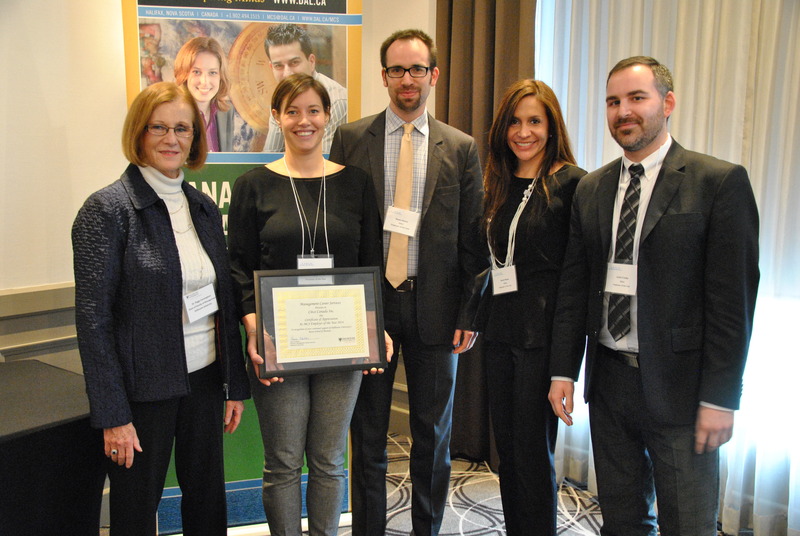 We were pleased to present Daphne with her certificate of achievement yesterday at our Employer Appreciation Breakfast event. A major in Finance, Daphne spent her final co-op at Scotiabank Global Banking and Markets as a Sales and Trading Analyst, a highly sought-after co-op position. 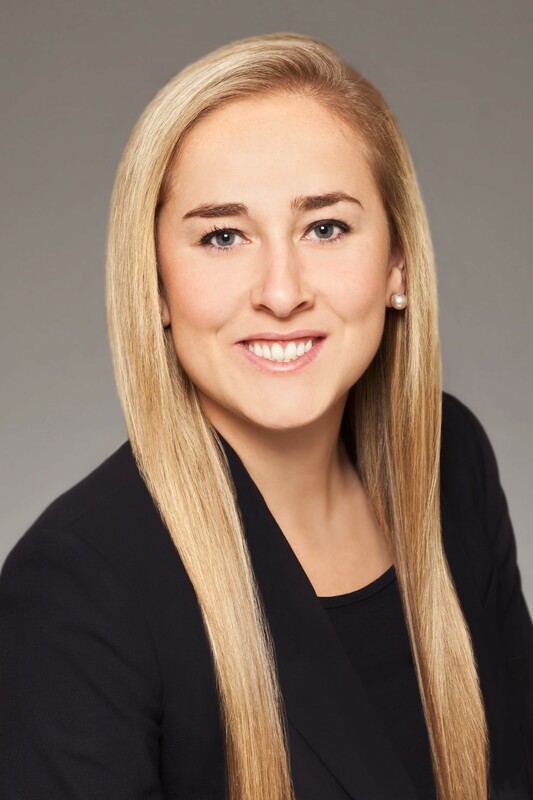 She has since accepted a position for the Scotiabank Global Banking and Markets Sales and Trading Rotational Program beginning August 2015, and in the interim, was selected by Scotiabank to be a GBM Student Ambassador to act as a liaison between the Bank and the Rowe School of Business. Daphne has been highly involved in life at Dalhousie. She has been a member of Dalhousie’s Women’s Varsity Soccer Team for four years, and was team captain her fourth year. As a varsity athlete, she achieved two consecutive Atlantic University Sport (AUS) Championship Titles, and subsequently travelled across Canada to represent Dalhousie in the Canadian Interuniversity Sport (CIS) Playoffs. 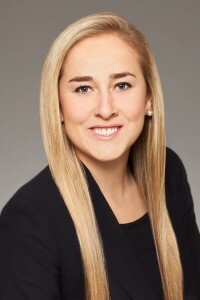 She is also actively involved in the Rowe School of Business as Co-President of the Dalhousie Investment Society, which has over 150 members. An Executive Member and Academic Delegate on the Rowe School of Business 2015 Jeux de Commerce Central team, Daphne helped capture 1st place in the International Business category along with her two teammates. Academically, Daphne has received eight scholarships, the most recent of which being the very prestigious Frank H. Sobey Award for Business Excellence. She is also an invited member of the Golden Key International Honor Society and has been on the Dean’s List 6 times. Recognizing the importance of volunteerism, she is a Dalhousie representative on the Student Organizing Committee for the Halifax Relay for Life in support of the Canadian Cancer Society. Daphne’s dedication to academic, extra-curricular, career and leadership excellence is an inspiration to other students and makes her the obvious choice for our Co-op Student of the Year award. Congratulations, Daphne! Citco Group of Companies is a worldwide group of independent financial service providers serving the world’s elite hedge funds, private equity and real estate firms, institutional banks, Global 1000 companies and high net worth individuals. Citco services these sectors – offering hedge fund administration, custody and fund trading, financial products and corporate and trust planning solutions. Established 8 years ago, the Halifax office has grown to be a professional team of 350 people who service over 150 clients. 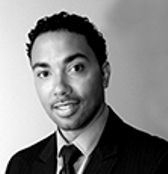 This success has been built on an ability to innovate and consistently deliver a quality product. Since 2008, Citco has supported an impressive 21 co-op work terms. In addition to providing quality experiences to our students through employment, Janet Olsen and her team at Citco are consistent supporters of Management Career Services events, volunteering their time as mock interviewers for events such as Super Wednesday and The “You’re Hired” Interview Competition as well as attending annual networking events.Year over year, Citco graciously hosts our students for Corporate Tours, providing students with an opportunity to tour their office, learn more about what Citco does, and get a feel for the corporate culture. We caught up with former and current co-op students to find out what makes Citco a great co-op employer. Watch the Youtube video. Thank you to Citco for your ongoing support of Dalhousie’s Faculty of Management Co-op program and overall student development. Congratulations on being chosen as our 2014 Employer of the Year! Congratulations to this year’s honorees, and Happy National Co-op Education Week to all of our valued employers who continue to provide our students with great experiential learning opportunities. It’s National Co-op Education Week, and what better time for Management Career Services to announce our 2014 Employer of the Year Award. 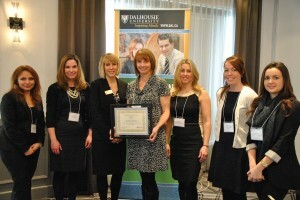 Management Career Services is pleased to present this year’s Employer of the Year Award to Bell Aliant. Bell Aliant receives the Employer of the Year award at the Employer Recognition Breakfast. Dalhousie Faculty of Management co-op students at Bell Aliant, from left to right, Carolyn Silver, Leigha Acott, Mack Diggins, Megan Clarke, Joanna St Laurent, and Ryan Jones. 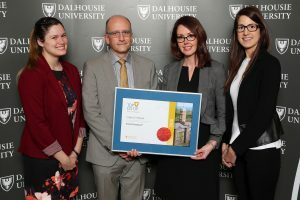 Bell Aliant has been an employer partner of Dalhousie’s Faculty of Management for almost 10 years, and has hired many students for co-op work terms and post -graduate positions during that time. They have worked with MCS to ensure a streamlined process for posting jobs and hiring Dalhousie students across all programs. Additionally, they have provided high quality work experiences in various positions within their organization. Bell Aliant has also been an active partner in career development events led by Management Career Services, for example, in the fall of 2013, Bell Aliant supported our Halifax Corporate Tour by hosting a group of students for an onsite information session. Thank you to Bell Aliant for your ongoing support of Dalhousie’s Faculty of Management Co-op, Internship, and Corporate Residency programs and overall student development. Congratulations on being chosen as our 2014 Employer of the Year! 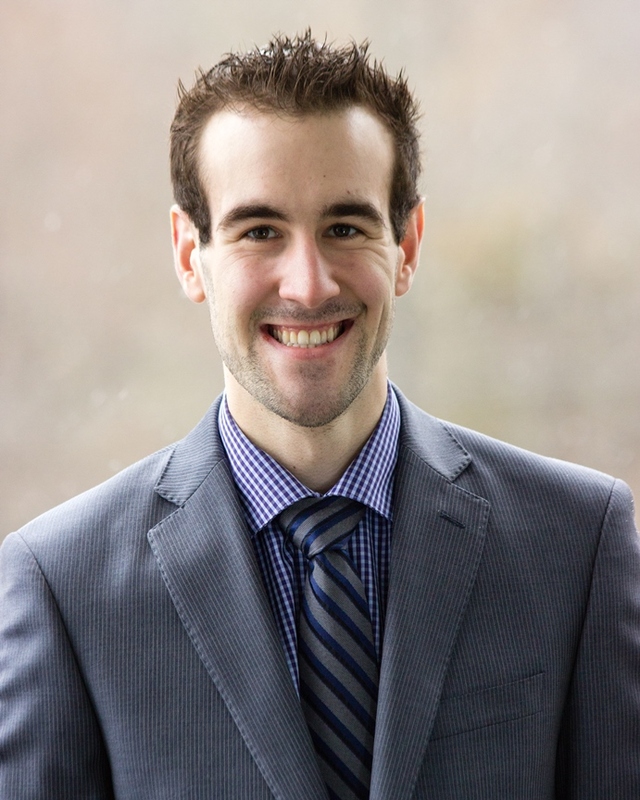 “While working in a professional services firm can be challenging at times, being able to take the concepts you learned in the classroom and apply them in real-world situations for your client/employer is definitely the most rewarding part of the co-op program.